Hidden among the summer flowers. Is there any other bird so celebrated in poetry as the Bobolink? Bryant, Emily Dickinson, and many others have portrayed the wonder of Bobolinks in their poetry. Bobolinks are celebrated in music, too. In fact, an a capella singing group at Middlebury College calls itself the Bobolinks. Would anyone willingly listen to a singing group that called themselves the Middlebury Grackles. Of course not. Bryant’s poem (and there is much more) describes Bobolinks perfectly. Bobolinks are the only North American bird that is white on the back and black underneath like a “tuxedo worn backwards”. That creamy, yellowish-white nape is unmistakable, as Bryant points out. Of course, this distinctive plumage applies only to breeding males. Females and non-breeding males are drab and buffy with stripes on the face, back, and rump, blending perfectly into their grassy habitat. Unusual among songbirds, Bobolinks undergo two complete molts each year-one molt on the breeding grounds and another on their wintering grounds. After this second molt, the males are rather drab, but the yellowish tint to their feathers rapidly wears off to reveal the stunning breeding plumage for which they are best known. And how about that ebullient song. In spring and early summer, the Bobolink’s song rings out through the countryside. Described as “a bubbly delirium of ecstatic music” or sometimes as an imitation of the loveable Star Wars robot R2D2, song alone marks the Bobolink as a bird of distinction. In the Northeast the song of the Bobolink is as characteristic of summer as the tinkle of the bell announcing the arrival of the ice cream truck. During breeding season Bobolinks are widespread in North America, ranging from the prairies of the Midwest to the hayfields and pastures of the northeastern United States and southern Canada. Here they build their nests on the ground, fledge their young, and molt their feathers. After a visit that seems too short, Bobolinks depart in late summer and early fall for their wintering grounds in the grasslands of Argentina, Paraguay, and Bolivia with only a stop or two along the way. Although Bobolinks are still fairly common birds, the population has steadily declined for many years. Habitat for Bobolinks was optimal when the United States was predominantly rural and the land was cleared for farming. As agriculture declined and hayfields and meadows reverted to forest, breeding habitat for Bobolinks was lost. Furthermore, intensive hay cutting during the breeding season destroys many Bobolink nests and fledglings each year. Preservation of open grasslands and providing incentives for farmers to delay hay cutting until after the breeding season is over would help to stabilize the population of these iconic birds of summer. All is not well for Bobolinks wintering in the southern hemisphere either. Huge flocks of Bobolinks forage in the rice fields of South and Central America (the Latin name for Bobolinks, Dolichonyx oryzivorous, means “long-clawed rice-eater”), where they are harassed by angry farmers. Likewise, the unregulated use of pesticides in the southern hemisphere poses an additional threat to the dwindling Bobolink population. What to do? The first step in developing a conservation plan is to learn more about the relative threats to Bobolink populations throughout their range. In this regard an investigator from the Vermont Center for Ecostudies, Dr. Rosalind Renfrew, has done seminal work, revealing the secrets of Bobolink behavior throughout their annual cycle. Dr. Renfrew’s thoughts on the plight of the Bobolink are recounted in the interview with her that follows this article. You have been studying Bobolinks for some time now. What sparked your interest in Bobolinks in the first place? Bobolinks may be charismatic, with their bubbly song and striking colors, but what really drew my attention was their incredible migration, and the fact that we knew next to nothing about their life on the other side of it. The results of the 2nd New York Breeding Bird Atlas were published recently and documented a modest 8% decrease in blocks with nesting Bobolinks compared with the previous survey in 1980-85. What can you tell us about Bobolink population trends in Vermont and across the country? Are Bobolinks a Species of Special Concern in Vermont? Yes. In Vermont the distribution of Bobolinks has not changed appreciably in the last 25 years, but where they do occur, abundance has been declining. They occupied 6 percent fewer blocks in the second Vermont Breeding Bird Atlas compared to the first Atlas. What is of more concern, however, is that the Breeding Bird Survey shows an annual decline of 2.9% for Vermont from 1982 to 2007. Vermont is part of a larger-scale trend: Bobolink populations have been decreasing by 1.8% per year range-wide since 1970, and declines have been most severe during the last 10 years. Canada has lost 88% of its Bobolink population since 1970. Because declines have continued unabated during the last 10 years and threats to populations persist, Canada added the species to its Threatened list in 2010. Bobolinks, of course, are champion migrators. You have obtained some fascinating results concerning Bobolink migration using geolocator technology. What did you discover? What surprised you most about Bobolink migration? Geolocators represent an innovative new technology for analyzing bird migration patterns. Small light-sensitive chips attached to captured birds record and store data based on the time of sunrise and sunset that can be evaluated with software when the birds are recaptured. The data we obtained from only three Bobolinks (2 from VT, 1 from NH) shed dramatic new light into the location and timing of migration stopovers, routes, and wintering grounds. Two birds that were breeding 7 km apart in the Champlain Valley did not winter together, nor did they share the same migration route. Each of the three birds had 2-4 stopovers per migration, and some fall stopovers lasted for weeks. The Bahamas are a short but potentially important stopover during spring migration, and Colombia and Venezuela appear to be important stopovers in the spring and fall, respectively. Although Bobolinks do move around to some extent during winter, they do remain in the same general area for 2.5-3.5 months. All three birds left their wintering areas during the first week of April to migrate north (it was previously thought that they departed in early March). These are just some of the highlights. The biggest surprise was a transoceanic flight by one bird of 1900 km (1100 mi) within 24 hours - which means the bird flew an average of 50 mph for 24 hours. I checked and rechecked my data, and consulted with the developers of the geolocator software, and it is a certainty that the bird made this trek as part of its migration north. Undoubtedly, it had the help of a tailwind, and the weather data from the area on that day support this assumption. Even so, I never thought this species to be capable of migration speeds similar to those of shorebirds. My colleagues and I hope to retrieve more geolocators this year that will provide insights about the migration patterns, timing, and wintering areas of populations across the breeding range. A few years ago you discovered a huge, previously unknown flock of Bobolinks feasting in the rice fields of Bolivia and speculated that there might be more. What is the significance of this finding? Are there more mega-flocks of Bobolinks in South America yet to be discovered? This was the first time that such enormous flocks were documented, although it was nothing new to the local farmers. After this discovery, biologists in Argentina searched in rice fields and also found large Bobolink flocks. All observations on the wintering grounds, however, collectively account for less than 5% of the entire Bobolink population; there are clearly other areas supporting wintering Bobolinks that have not been discovered. I suspect that Bobolinks also overwinter in the wetlands of the Pantanal (southern Brazil), but this area has so far only been described as a migratory stopover. It’s hard to believe that Bobolinks are regarded as pests in South and Central America, whereas they are revered in the United States and Canada as an iconic summer bird. You have surveyed farmer’s attitudes toward Bobolinks in the southern hemisphere. What did you find? What can be done to change these attitudes? First and foremost, it is critical to recognize that there is actually little difference in attitudes between farmers in North and South America- just different pests. A rice producer in Bolivia is no different from a sunflower producer in the U.S. struggling to keep Red-winged Blackbirds at bay. Although birdwatchers may enjoy the Bobolink, scathing remarks about the species appeared in farmers’ journals in Canada once the species was declared Threatened and had the potential to disrupt haying operations (farmers now have a 3-year exemption while a plan is developed). If you’re watching a species disrupt your operations, or literally eat into your income, probably nobody is going to change your attitude. Attitudes in Bolivia varied depending on the farmer’s experience with the Bobolink. Newer rice farmers weren’t bothered by the birds, while those who had been fending off the species for decades tended to have zero tolerance. My sense was that estimates of the damage caused by Bobolinks were often exaggerated by the latter group, and this has been seen with other species in other countries. But the threat to farmers is very real and needs to be addressed. Determining just how much (or how little) the birds are eating may help change perceptions, and may help farmers populate a cost-benefit analysis with some real numbers. The approach to take is not to talk farmers out of their perceptions, but rather to offer information and most importantly, attempt to develop solutions. While Canada works hard to bring back its population of Bobolinks, we need to be thinking about how to avoid exacerbating the problems for rice growers far south of us, whose control efforts may only make recovery here more difficult and expensive. The north hand needs to know what the south hand is doing, and vice versa; a holistic approach is needed. There are threats to Bobolinks in the northern hemisphere, too, especially the timing of hay cutting that coincides with Bobolink nesting and breeding. When you look at threats to Bobolinks across the board, which ones are most important to focus on from your perspective? Threats have so far been addressed only on the breeding grounds, and it is critical to continue to promote management practices that maximize nest productivity. Research from the Champlain Valley (carried out by Noah Perlut and Allan Strong at UVM), however, shows that even the best case scenario on hayed lands will slow but not halt declines. A study in Iowa on non-hayed lands found that to obtain self-sustaining populations of Bobolinks, increasing survival during the non-breeding season was essential. In both cases, survival is an important part of addressing population declines. We need to learn whether, how, and where we can take conservation measures to increase survival during migration and winter, while continuing to maintain and even create quality nesting habitat. In essence, a holistic approach that addresses threats throughout the Bobolinks annual cycle will be needed to get (and keep) Bobolinks back on track. In this article I would like to bring you up to date on our birding activities at the Catamount Outdoor Family Center in Williston. In my 2009 report I described our efforts to earn for Catamount a designation as an Important Bird Area (IBA). Here is what has happened since then. Catamount, located on Governor Chittenden Road in NE Williston, is a 500 acre preserve owned by Jim and Lucy McCullough and managed by their daughter and son-in-law, Abby and Eric Bowker. It operates as a not for profit organization and is a recreational facility offering mountain biking, hiking and running in the summer and fall and cross country skiing and showshoeing in winter. The property provides a broad array of habitats that attracts a rich diversity of bird life. Northern hardwood, white pine-hardwood and hemlock forests, early successional forests, marshes, ponds, and open grasslands are all found at the Catamount Outdoor Family Center. Between 1996 and 2008, the McCulloughs, GMAS, the UVM Spatial Analysis Lab, and I working with the Vermont Center for Ecostudies and the Vermont Breeding Bird Atlas survey identified a total of 94 species of birds at Catamount and confirmed breeding status for 24 species. Subsequently, surveys conducted after the Breeding Bird Atlas surveys concluded added several new species and new breeding birds to this total as described below. In 2009, the GMAS began a systematic survey of the bird population at Catamount. Several members have surveyed the area on a weekly basis (monthly in winter), and have recorded and tabulated the results. To date we have completed 71 surveys in all four seasons. We have added to our original list so that the recorded species now totals 126 with breeding confirmation in 43. The immediate goal of this effort is to create a bird checklist for Catamount which will indicate seasonal frequencies for each species and designate breeding confirmations. This checklist will be completed and available for distribution by May 2011. The checklist will be provided to Catamount to distribute to anyone who wants to watch birds there and a link to the checklist will appear on the GMAS website. Notable species seen regularly at the COFC include Bobolinks, Brown Thrashers, Black-throated Green and Black-throated Blue Warblers, Savannah Sparrows, and Easten Bluebirds. Additions during the two Breeding bird Atlas survey years include American Bittern, Northern Shrike, Bohemian Waxwing, Philadelphia Vireo, Blue-winged, Wilson’s, Palm and Prairie Warblers, Winter Wren and Lincoln’s Sparrow. New breeding confirmations include American Kestrel, Black and White, Black-throated Blue and Blackburnian Warblers, Scarlet Tanager, Eastern Wood Pewee, and Red-breasted Nuthatch. With the survey results and checklist in hand, the next step for GMAS and Catamount will be to plan how best to utilize this property for bird and nature education. A first step will be to hold the annual GMAS Birdathon at Catamount on Saturday May 18. Any and all additional ideas are welcome. Please join us and stay tuned! Note: A link to the COFC bird checklist can be found by selecting the Resources heading at the top of this page and scrolling down to the bottom of the page. Enjoy. What happened this winter? Plenty! The 2010 Burlington area Christmas Bird Count took place on December 19, 2010 and the results are in. Shirley Johnson organized 48 CBC participants, who scoured the Burlington circle for birds from dawn to dusk. Seventy-five species were identified, exceeding the old record of 73 set in 2005. New high counts were obtained for Greater and Lesser Scaup, Ring-necked Duck, Peregrine Falcon, Rock Pigeon, Hairy Woodpecker, Pileated Woodpecker, and Golden Eagle. Beautiful winter weather contributed to the enthusiasm of the counters as well as the entertaining round-up at the Johnson's home that evening. Thanks to all of the participants. The GMAS held its first field trip of 2011 along the shores of Lake Champlain on January 8. bohemian waxwingTwenty-three hardy birders counted 25 species of ducks, geese, grebes, raptors, and songbirds at Shelburne Bay, Shelburne Town Beach, and Charlotte Town Beach. Highlights included a flock of Canada Geese that flew overhead led by two Snow Geese, a Bald Eagle at Shelburne Bay harassing the winter ducks, a handsome male Northern Pintail at the Charlotte Town Beach, and a Red-bellied Woodpecker at the Shelburne Town Beach. Here is a photo of the Northern Pintail taken by Scott Sainsbury and used with his permission. Later in January Sean Beckett, our 2008 Haidee Antram Award recipient, presented an entertaining program focused on Northern Saw-whet Owls. Sean conducted research on Saw-whet Owls as an undergraduate at Vassar, then spent this past summer banding Saw-whet Owls at the Idaho Bird Observatory near Boise.Red Polls Despite their wide range in North America, little is known about the habits and migration patterns of these diminutive owls. Sean's program answered many of our questions about these fascinating, elusive creatures. Then in early February naturalist David Govatski presented an informative program describing the behavior of irruptive species, especially Bohemian Waxwings and Common Redpolls, both of which are abundant in Vermont this winter. Predicting irruptions is more art than science, but David shared his vast knowledge of forests and birds with us to help us better understand these irruptions. We thank David for his excellent presentation, Larry Clarfeld for a spectacular photo of a Bohemian Waxwing, and Jim Morris for a great photo of irruptive Common Redpolls. The GMAS has more programs, field trips, and bird monitoring surveys scheduled for March and April. Consult our Calendar of Events for details. My stereotypical vision of birding used to be an individual or group, strolling slowly, and then stopping, binoculars pointing to a sound or movement, ears cocked to identify, binoculars tilted upward. After kayaking around Lake Champlain, I want to add another version of this passion: the seated floating birder. A small, human-powered paddle craft, kayak or canoe, allows access to places that may be denied the walker. Yes, for the birder, there is the same occupational hazard of the neck that gets tired tilted back, but there are distinct advantages. There are no leaves or sticks to crackle underfoot, no soft mud holes to sink into while looking above. At the same time, I have to admit there are disadvantages. 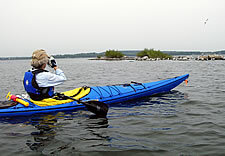 Just try to prevent a paddle craft from rocking gently while trying to pin binocular focus on a flitting object. Oh yes, binoculars – even the kind that float don’t always like to be dropped into water, much less the kind that don’t float. Using a spotting scope would be kind of a tough act. Slippery rocks or mucky clay challenge each attempt to enter or get out of the boat. But, even given all this, it’s a great way to go. The Missisquoi Wildlife Refuge, accessed by Route 78 in West Swanton, is one of my favorite places to paddle and observe birds and other wildlife. It has also been designated an Important Bird Area by the National Audubon Society. While trails abound, taking to the water offers access to places unreachable on foot. Civilization disappears in this watery world. The 6,642-acre refuge provides a rich habitat for nesting and migratory birds as well as other forms of wildlife. The 88-mile Missisquoi River, that drains 1,200 miles of Vermont and Quebec land, has over the centuries since the glaciers, Lake Vermont, and the Champlain Sea receded, created and is still building a delta with three river mouths and numerous side channels. In a few centuries, barring unnatural occurrences, the delta will reach the Canadian border. Charcoal Creek, Dead Creek, which are former channels, and the current main channel of the Missisquoi with its three mouths, all can be easily accessed from marked launch sites. While this is certainly not the place to see some of the species that inhabit upland areas and the Green Mountains, shore birds, ducks, grassland birds, other lower altitude species, and other wildlife abound. When looking for a beautiful and easy paddle on protected water, I’ll choose Dead Creek. A short paddle up the Missisquoi from Louie’s Landing on Route 78, Dead Creek meanders directly north into reedy Goose Bay. And meander it does. This former channel of the Missisquoi offers little current between banks of overhanging silver maples and occasional willows draped with spider webs. It’s a safe setting for mergansers to raise their young and leopard frogs to perch. Swallows swoop, an occasional kingbird watches, an osprey cruises overhead. The shallow water provides perfect fishing ground for great blues that lift off as we approach, only to circle back as we continue. Watching that bird spread its wings and take flight has to be one of life’s great gifts. Belted kingfishers lead the way, chattering. On one paddle, I concentrated on photographing a blooming reed for later identification while my paddling partner Cathy spotted and successfully took a picture of a much less common, perfectly posing black tern. Depending on the time of year and the often predictable water level, the paddler looks across surrounding fields and marshes in high water or up at the banks with little visible land behind in low water. Choose your season. In high water, the sand bar at the Goose Bay mouth of Dead Creek is submerged and of little interest. In low water, the scene changes radically and the sand bar which emerges can be a haven for shore birds as well as egrets, native and migrating gulls, and of course cormorants and Canada geese. From the Goose Bay end of Dead Creek, turning around and retracing the roughly five miles back to Louie’s Landing, gives an opportunity to savor the river again from the other direction – something I really enjoy. For the very energetic on a day with little wind, another return route heads north, traces the shore of Goose Bay, rounds Martindale Point, follows the shore of Gander Bay to the first mouth of the Missisquoi. The kayaker can then paddle upstream back to the landing, a trip of roughly nine miles, almost half of which is upstream although in low water the current is not strong. The bays of this route are reed-lined and a haven for what the Refuge lists as 20,000 migrating ducks, particularly on the fall days when the wind is from the south. Fall foliage often comes early because the trees along the shore have wet feet. In fact, I challenge you to even determine where the water stops and the shore begins. In addition to the migratory birds, nesting ducks include wood ducks, green and blue winged teal, common goldeneye, hooded mergansers, and black ducks. The Refuge is the only place in Vermont that the black tern is known to nest. One spring/early summer day many years ago, we left Louie’s Landing and paddled north down the Missisquoi to Shad Island. The water was high enough that we could paddle over a submerged bank of the river into a low land that had become a pond surrounded by trees. We were near the great blue heron rookery that at one time numbered more than 600 nests. What an experience watching them land on a tree limb. The limb bends, wings flap, the limb rocks up and down, until at last: equanimity. The herons ignored us sitting stock still in our canoe. They were not the only nest building, mating species. Fish thumped our canoe, invisible in the murky water, swallows and flycatchers chased each other, and dragonflies attached and detached. It was a regular bacchanalia! We drifted for a couple of hours, enchanted at the re-creation of the life around us. Late in the afternoon, we paddled back upstream stopping to watch a beaver work. Swimming to the far shore it left the water and selecting a thin branch, quickly gnawed through, dragging it back to into the river and to the far shore. That must have been a special tree. A little further on, we didn’t see the deer at the edge of the water before it saw us and disappeared in a flash of white. We could hear a wood thrush singing in the distance. What had started out as a simple paddle turned into an incredible experience which I can still picture clearly even years later. I’ve only scratched the surface. I haven’t even mentioned the turtles. I may – or may not have seen the prehistoric-looking spiny soft-shell turtle. Well, I did see one. But was it real? Back during the Route 78 bridge construction when the state constructed platforms on which the displaced turtles could sun themselves, we had launched kayaks next at the state site adjacent to the bridge. We neared the first platform with great caution and at a distance. Much to our amazement, a spiny soft shell was sunning itself within photographic range. We later learned that some of the platforms had decoys to encourage the real thing to climb aboard. Did we see the real thing? Since then, I’ve seen quite a few, and I do believe. Just paddle out into the refuge on a sunny day and it won’t only be the spiny soft shell variety you can catch catching the rays on every available log and rock. On the basis of these and other experiences in the Missisquoi Wildlife Refuge, I’d consider designating a new species – or maybe it would be a sub, sub species. How about the Magnificent Northern Sitting Floating Birder? To give this new species a push, I’ll even volunteer that I am one - at least in the Missisquoi Valley Refuge. Oh, and don’t forget to stop at the Refuge headquarters before you leave the area. They have bird lists, reference books and displays, and trail maps in case you want to be one of those traditional standing birders. Margy Holden is a Board member and former President of the Green Mountain Audubon Society and the coauthor with Cathy Frank of the book A Kayakers Guide to Lake Champlain. In early March The State of the Birds: 2010 Report on Climate Change was released. This 32 page report follows on the heels of the 2009 report that showed nearly a third of the nation's 800 bird species were endangered, threatened or in significant decline. The 2010 report represents a collaboration between the U.S. Fish and Wildlife Service and experts from the nation’s leading conservation organizations including Audubon. The 2010 report presents the first systematic analysis of what may happen to bird populations in each major biome of the United States as a consequence of climate change. Forest birds are expected to fare better than many other groups because of their large ranges and high reproductive potential. However, even within this group there are some species expected to struggle, for example the Bicknell’s Thrush of Vermont’s mountains. Ocean birds include albatrosses, petrels, puffins, and murres. These birds face challenges associated with rapid widespread shifts in pelagic food resources as a result of warmer ocean temperatures and changing wind patterns. They also have a low reproductive rate making these species less resilient in general. In the conclusions the report worries that, “Without additional information on how birds are responding to the effects of climate change, we will be unable to adjust our conservation and management strategies. Well-designed monitoring systems will also be needed to evaluate the effectiveness of the strategies used to counteract effects of climate change on bird populations.” Audubon chapters can do their part by monitoring bird populations in Vermont. This article is reprinted from the May, 2010 issue of Otter Tracks, the newsletter of the Otter Creek Audubon Society. Cormorants! Love them; hate them; but ignore them? Impossible! Double-crested Cormorants on Lake Champlain are simply too visible to ignore. Cormorants are the birds that people love to hate. Recently, the US Fish and Wildlife Service, the federal agency responsible for “managing” the cormorant population, proposed reducing the population on Lake Champlain drastically after receiving complaints from fishermen for years. What is behind the outrage directed at cormorants? Why are cormorants persecuted in the United States and not in Canada? Read on. (On the islands near Cape Sable) there are cormorants, three kinds of ducks, geese, murres, bustards, sea parrots, snipe, vultures, and other birds of prey; sea larks of two or three kinds; herons, large sea gulls, curlews, sea magpies, divers, ospreys, eiders, ravens, cranes, and other sorts which I am not acquainted with, and which make their nests here. Later in this account Champlain includes a reference to Cormorant Island (Isle aux Comorans), where his crew collected a “caskful” of cormorant eggs. We do not learn the fate of these eggs, however, which reportedly are edible only by predatory gulls or perhaps vultures. In the 19th century John J. Audubon himself painted Double-crested Cormorants that he observed along the coast of Labrador and offered the following description of them in his Ornithological Biography. To the low islands (near the southwest coast of Labrador) the beautiful Cormorant resorts each spring for the purpose of breeding. It arrives from the south about the beginning of May or as soon as the waters of the Gulf are sufficiently free of ice to enable it to procure food. JJ Audubon, Ornithological Biography, vol. 3, 1835. Audubon goes on to describe with astonishing accuracy the anatomy, distribution, habits, and nesting behavior of Double-crested Cormorants, including a vivid description of “…the birds on their nests, all over the rock, which was completely white-washed with their excrement, that emitted a disagreeable odour to a great distance”. Although Double-crested Cormorants were common coastal birds at the beginning of the 20th century, cormorants were rare on Lake Champlain as recently as the 1970’s. The Vermont Breeding Bird Atlas recorded only a single nesting pair of cormorants in 1981 and the New York Breeding Bird Atlas found only 6 nesting blocks in 1984, mostly on Long Island. However, the New York atlas noted that one colony was established on the Four Brothers Islands in Lake Champlain, a harbinger of events to come. Apparently, DDT exerted the same deleterious effect on cormorant egg development that was observed in raptors, causing the cormorant population nationwide to crash. After DDT was banned in 1972 the door was open for cormorants to return to their natural breeding sites and beyond. Furthermore, the expansion of catfish aquaculture in the South supplied a rich, new food source for cormorants on their wintering grounds, leading to improved survival and healthier birds during the breeding season. After DDT was banned Double-crested Cormorants expanded their range to include Lake Champlain. The cormorant population increased rapidly for more than two decades until it peaked in 1999. Since 1999 the population has remained stable at about 9000 nesting pairs, occupying 4500 nests annually. In Vermont one of the largest cormorant colonies on Lake Champlain historically was established on Young Island just offshore from Grand Isle. Young Island was donated to the state of Vermont by a local physician several years ago and is managed by the Vermont Fish and Wildlife Department. In 1999 the Department obtained a depredation permit from the USFW Service, allowing the state to oil the eggs of nesting cormorants to suffocate them and to shoot cormorants if necessary. It worked. The eradication program reduced the number of successful cormorant nests on Young Island significantly. An unintended consequence of this program, though, was that nesting cormorants dispersed to other Champlain islands to breed, in particular the Four Brothers Islands in New York. The total number of nesting cormorants on the lake hardly budged; they were simply redistributed. This observation suggests that attempts to control the cormorant population on the lake, must take into account the fact that disrupting cormorant nests on one island will likely cause cormorants to move their colony elsewhere. To effectively control cormorants on Lake Champlain, a lake-wide management program will be necessary. Pressure to reduce the number of cormorants on the lake comes primarily from sport fishermen, who believe that cormorants threaten fish stocks in Lake Champlain. Cormorants are indeed large, fish-eating birds that consume about a pound of fish each day to meet their energy requirements. Although cormorants are opportunistic feeders, consuming whatever fish are available, they prefer smaller fish in the 3-6 inch class that swim in shallow water. In Lake Champlain that means Yellow Perch, which are present in abundance and often form schools in shallow water. Cormorants are excellent divers, propelled by their webbed feet, but prefer fish that swim in water less than 20 feet deep. Yellow Perch, Walleyes, and Smallmouth Bass, all fill the bill, so to speak. Trout and salmon on the other hand, species of great interest to recreational fishermen, are seldom found in the stomach contents of cormorants, the exception being those occasions when large numbers of small trout are released during stocking. Incidentally, it should be noted that Lake Trout and Landlocked Salmon do not reproduce in Lake Champlain in sufficient numbers to produce a sustainable population. It is largely a “put-and-take” fishery. The Vermont Fish and Wildlife Department “puts” and the fishermen “take”. Several studies have attempted to measure the effect of cormorants on fish stocks with ambiguous results. In fact, separating the impact of cormorants on fisheries from other adverse factors such as pollution, toxins, algae blooms, weed growth, predatory fish such as lamprey, dams and other barriers to reproduction, invasive species such as zebra mussels, climate change, a shifting food web, and the “take” by sport fishermen themselves has proven to be difficult, if not impossible. Studies performed on Lake Oneida in New York have been cited to support the view that cormorants damage fish populations, in this case Yellow Perch. However, Lake Oneida is only 22 miles long and 22 feet deep on average, hardly comparable to Lake Champlain. At the other end of the spectrum, some, but not all studies from Lake Huron have been reported, which suggest that cormorants played a role in damaging the fishery there. Lake Huron is huge-over 200 miles long and 150 miles wide. Yet its fish populations, including introduced Chinook Salmon, have struggled for years for a variety of known and unknown reasons, only one of which is the burgeoning cormorant population. Whether the results of studies performed on Lake Huron are applicable to Lake Champlain is doubtful, if not misleading. Do cormorants have an impact on fish stocks? Yes. Does this impact adversely affect fish populations disproportionately on Lake Champlain? Unknown. Another complicating factor has been the recent appearance of large schools of alewives in Lake Champlain. Cormorants colonizing the Four Brothers Islands have been forced to forage in the deeper waters of the lake where perch are seldom found, but alewives are abundant. Recent analyses of the stomach contents from cormorants nesting on the Four Brothers Islands have turned up predominantly alewives. Alewives are an invasive species in Lake Champlain, whose populations are subject to wide variation in numbers as well as temperature-related “die offs” as occurred in 2008. Although salmonids (trout and salmon) feed on alewives voraciously, the presence of the enzyme thiaminase in alewives could result in a deficiency of thiamine in predatory trout and salmon and their eggs. In this sense predation of alewives by cormorants may not be such a bad thing. Less controversial is the effect of cormorants on vegetation. Cormorants build their nests in trees and on the ground by breaking off twigs and branches. Even more damage results from the ammonium-rich guano released by roosting birds. Their excrement coats the trees, rocks, and ground vegetation, defoliating the trees and killing the vegetation in short order. One need only visit the Four Brothers Islands to see the results of cormorants roosting and nesting there. One of the islands (Island D) where cormorants have been allowed to roost in the past consists of white-washed rocks and dead trees. Islands left untouched by cormorants support lush vegetation. Although there is little evidence that cormorants are responsible for widespread pollution in the lake, comparable say, to agricultural runoff, local effects on inhabited islands may be considerable and in theory could pose a public health problem, not to mention the “disagreeable odour” described by Audubon. By permit the USDA Wildlife Division is allowed to mitigate cormorant-related damage when requested to do so by private landowners, using both lethal and non-lethal methods. Although this represents a band aid approach to the problem of cormorant population control, the mitigation of cormorant-related damage to private property, not to mention public health concerns, seems reasonable. Another cormorant conundrum relates to interspecies competition. Birds are prisoners of their habitat. Lose the habitat; lose the birds. Given the adverse effect of cormorant guano on vegetation, concern about the loss of habitat suitable for other colonial birds and their nests is understandable. What species might be affected? Well, gulls for one. But gulls on Lake Champlain are thriving. In fact, Ring-billed Gulls are also targeted for population reduction by the Vermont Fish and Wildlife Department and the USFW Service. Interestingly enough, gulls prey on the eggs of Double-crested Cormorants and seem to cohabitate with them quite well. Terns? Common Tern populations have rebounded modestly on selected Lake Champlain islands under the watchful eye of Audubon Vermont’s Mark LaBarr, the leader of the Common Tern Restoration Project. Caspian Terns are uncommon on Lake Champlain, but seem to have gained a foothold in recent years. Restoring Common Terns to the lake has required preserving suitable nesting conditions, including the exclusion of cormorants and gulls from nesting sites, and fending off predators such as Great Horned Owls, Black-crowned Night Herons, Ruddy Turnstones, and mink. The success of this project demonstrates that an intensive focus on restoring and maintaining selected bird populations works. Herons and egrets? Regionally, Great Blue Heron, Black-crowned Night Heron, and Great Egret populations seem to be stable, although Black-crowned Night Herons are a species of moderate concern nationally. Cattle Egrets? Cattle Egrets are non-natives in North America, but the population is thriving nationally, having spread from Florida, where the first colony was established in 1952, to many of the coastal northeastern and southeastern states. In Vermont the small population of Cattle Egrets nesting on Lake Champlain is holding on tenaciously despite many obstacles to its growth. Interspecies competition is an issue (and works both for and against cormorants), but does not justify a wholesale reduction in cormorant numbers. In fact, prior to 1999 the majority of cormorant nests in Vermont were established on Young Island until the Vermont Fish and Wildlife Department intervened, causing widespread dispersal of nesting cormorants to other Lake Champlain Islands. Perhaps the issue of habitat destruction and interspecies competition would be less problematical today if this intervention had not occurred. Protecting species of concern where they exist or have existed as exemplified by the Common Tern Restoration Project, rather than a drastic reduction in the population of perceived “nuisance” birds, might be a reasonable alternative approach to preserving biodiversity on Lake Champlain. The USFW Service is developing a draft proposal to reduce the size of the cormorant population on Lake Champlain to 3000-6000 birds from the current 14000-18000 cormorants according to the Burlington Free Press (July 11, 2010). The Vermont Fish and Wildlife Department supports the most aggressive approach enthusiastically, reflecting the Department’s traditional bias toward the concerns of fishermen. Nationally, the USFW Service is prepared to kill over 200,000 cormorants annually. Is this legal? From a legal standpoint, Double-crested Cormorants are covered under the International Migratory Bird Treaty of 1918 and its amendments. This treaty is responsible in large part for outlawing the practice of hunting Snowy Egrets and Great Egrets for their plumage and preventing the widespread massacre of shorebirds by hunters. Not before Eskimo Curlews were hunted to extinction, though. The treaty has been effective in protecting migratory birds threatened by overhunting or loss of habitat. In theory, the treaty should also protect birds such as cormorants whose populations have been successfully restored. Indeed, in Canada the return of cormorants to their native haunts is viewed as a huge success story. However, in the United States economic considerations often receive higher priority than maintaining biodiversity. The International Migratory Bird Treaty allows states wide latitude in managing bird populations within their borders and provides no enforcement mechanisms when states violate the intent if not the provisions of the treaty. Thus, it is unlikely that the USFWS plan, when it eventually comes to light, will be subject to negotiation with other signatories under the terms of the International Migratory Bird Treaty. The cormorant conundrum produces more questions than answers. Consider these questions. Where exactly will cormorants be allowed to nest on Lake Champlain without harassment? Will there be unintended consequences associated with attempts to reduce the cormorant population such as disturbance of other nesting birds? Will killing cormorants really improve the nesting success of more valued birds like herons, terns, and egrets? Is an industrial-scale program to kill cormorants a cost-effective use of scarce resources? What will the cost of this program be now and in the future? Is the knowledge base about cormorants and their impact on the Lake Champlain fishery sufficiently robust to determine with confidence that drastic population reduction will improve selected fish stocks? Or are we simply removing a visible, unpopular, predatory bird from the ecosystem that has become a scapegoat for many of Lake Champlain’s problems? At the very least careful public scrutiny of the USFWS draft proposal by all of the lake’s stakeholders is essential before the cormorant control program proposed by the USFWS is implemented. In the spring of 2009 the residents of the Golf Links neighborhood in Williston witnessed a most unusual event, the successful rearing of a family of Long-eared Owls. On June 4, Corey Forrest of Tamarack Drive heard a strange sound in his yard. A diligent search revealed five squeaking owlets at the edge of an old squirrel’s nest in a pine tree behind his house and a silent adult in a maple tree nearby. When Corey’s wife Shelly noticed that the adult had prominent ear tufts, she went to the internet to identify her new neighbors. While the adult had some resemblance to a Great Horned Owl, the babies’ squeaks were more compatible with Long-eared Owlets. When Shelly took a closer look at one of the adults, she noted a medium-sized, slender owl with long ear tufts, and a tell-tale bark-like pattern on its breast, very different from the barred pattern of a Great Horned Owl. 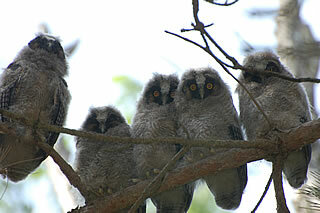 The babies also had a prominent white streak from forehead to beak, characteristic of Long-eared Owlets. Sure enough. This was a family of Long-eared Owls. Within a few days of their discovery the fledglings were seen hopping from branch to branch near the nest. By June 13 the youngsters were all capable of independent flight and could be seen landing on the Forrests’ backyard swing set. As the weeks went by the five young owls ventured farther afield under the watchful eye of their parents, always in the evening, returning to their pine thicket to rest during the day. By early July we could hear the young ones during the night hunting in the fields behind the neighborhood. They became harder to find during the day, the best neighborhood spotter being the Forrests’ young son Evan. After July 10 we no longer saw the young owls. They had presumably moved on to better hunting grounds, hopefully at the Catamount Outdoor Family Center just to the east. While they were in the neighborhood, the Forrests were kind enough to show the owls to many neighbors and birders. Long-eared Owls are widely distributed across North America but are rarely seen in our area. Data from the Records of Vermont Birds from 1973-83 and the first Vermont Breeding Bird Atlas Project from 1976-81 disclosed only 15 adult Long-eared Owls and only three breeding confirmations, in Sudbury, Waltham and Brandon. The second Atlas Project from 2003-07 noted only one breeding confirmation in Charlotte, two probable breeding pairs in Vergennes and Snake Mountain, and three other observations in the Champlain Islands and Northeast Kingdom. Their preferred nesting habitat is thick coniferous forests. The owls are secretive and strictly nocturnal in activity. Their long slender wings and graceful bodies allow silent and stealthy hunting for primarily small mammals over open fields at night. Bird experts suspect that Long-eared Owls are more common than observed owing to their secretive habits. By nesting so close to humanity, our Williston owls seem to be an exception to the usual pattern. They were very watchful, but unafraid, of the human, canine, and auto traffic that swirled around their home. We hope that this owl family will exhibit site fidelity and return to nest in future years. In the meantime we will be on the lookout for our new friends at the Catamount Family Center. The GMAS is very grateful to Shelly Forrest for sharing these magnificent photographs of her owl neighbors. Blue is not a common color when I think of food. Likewise, this particular day was unusual as I witnessed a scene I might never see again. And although it will always be memorable for me, it may have been just another normal day for a certain predator. Welcome to Ali’s Bed and Breakfast for the Birds. The day had just begun as a hint of light filtered through the trees. It was late November, when snow occasionally blankets the ground and the sun makes an appearance late in the morning. Climbing the basement stairs, I shut off my I-pod. So why was I still hearing birds? I had been listening to my Birdjam, an iPod downloaded with thousands of bird songs. I use this to study species. This strategy works well because it’s too hard for me to identify birds by sight alone. Birds hide so well and foliated trees in the summer can make it even more challenging. Add to this, my visual memory isn’t a personal strength and the binoculars I used to use were crummy. But…I had shut off my iPod. Why was I hearing the raucous shrieks of a party of Blue Jays? I could tell by their tone that they were upset. Under the birdfeeder, in a few inches of snow, I found the answer: A Merlin. She was barely visible, matching the drabness in the faint light of the morning, and at first I did not see her. She appeared to materialize right before my eyes. But a Merlin is a small falcon, not a magician. She was brown on her backside, with drab streaks on her belly, and wide bands of brown and gray on her tail. A dark eye-stripe made it appear she was wearing a mask. She’s a bird of prey, a surprise visitor at the Bed and Breakfast, moving from her summer residence to warmer climes for the winter. Or is she is a magician, the way her lightning speed made her appear out of thin air, tricking an innocent creature that let its guard down just long enough…For under the Merlin, pinned to the ground, as if engaged in a wrestling match, was a Blue Jay. I imagined the jay was at the birdfeeder and the opportunistic hunter dive bombed and struck the jay down in a surprise attack. The party of jays in trees surrounded the wrestling match. Now, obviously this was no party, but that’s what a flock of jays is called. They are like a family, caring and watching out for each other. Perhaps the jays were sending out warnings to others or were imploring the trapped bird to try harder to escape. The Merlin and Blue Jay were equal in length, but the falcon was much bulkier and more muscular. It was no use. The ruthless Merlin was too strong, her talons and beak too sharp. She held her wings out to balance, like a kid on a boogie board, while she took her prey. I could not watch any longer. I made myself move away, pulled to the kitchen by the whistle of the teakettle. Time to make oatmeal before going to work. While cutting up nuts and rinsing blueberries, I realized two creatures were preparing meals. Two blue breakfasts. Still hearing the struggle outside, I couldn’t help feeling sorry for the jay. Whenever I get the urge to “rescue” a preyed-upon victim, I remind myself, “every body eats…there is no good guy and bad guy in nature.” Perhaps this past summer that Blue Jay had dined on an egg or two that it had raided from a songbird’s nest. It’s all a balancing act and the jay would now become the next link in the chain. This was the wild world, right here in my yard. I am not the nature police and so I did not belong there, and should not go outside. This was an opportunity to witness nature without the TV, and it was much better than any PBS program. It was a purely live. “Everybody eats,” I told myself again as I carried my steaming hot oatmeal to the table. The day was finally bathed in warm light and I had to steal one last glance towards the wrestling ring. All I saw was a small crater in the snow so I could now join the scene and go out. A few downy sky-blue and white feathers blew away in the wind. The jay’s family had fled and the Merlin had disappeared. We were done preparing our blue breakfasts and had settled down to eat in peace. Perhaps the Merlin’s success this day will inspire her to come back to this B & B the next time she is passing through. Once in a while the weather in Vermont becomes so forbidding that birding outside is impossible. On these occasions one is forced to pass the time pursuing indoor birding. Curling up with your favorite birding book or the latest issue of Audubon Magazine are possibilities for birding indoors. Thumbing through the big Sibley’s or listening to Birdjam on your i-Pod to hone your birding skills are others. But here is an alternative you may not have thought of. Consider visiting a display of decoys or waterfowl carvings. Waterfowl decoys represent a uniquely American form of folk art with distinctive regional characteristics. Although the use of decoys to lure ducks, geese, and shorebirds into shooting range dates back hundreds of years to ancient Native American cultures, the “golden age” of decoy manufacturing occurred after the Civil War, when expansion of the railroads opened new, urban markets for commercial hunters and new opportunities for “sports’” to indulge their passion for duck hunting. This era closed just after World War I with the implementation of the North American Migratory Bird Treaty that effectively banned the sale of wild ducks and geese and outlawed the hunting of shorebirds. The rafts of decoys used by commercial hunters became redundant artifacts and disappeared into attics, cellars, and wood stoves. Seizing this opportunity, Joel Barber, an architect from Connecticut, became the first collector to recognize the artistic merit of hand-carved decoys. In his seminal book, Wild Fowl Decoys, Barber aptly referred to these carvings as “floating sculpture”. Soon Barber and a few other energetic collectors inspired by him were scouring the Atlantic coast, buying decoys and other hunting paraphernalia for pennies from their original owners. Barber and his friends William Mackey and George Ross Starr amassed huge decoy collections, which today would be worth several million dollars. At the same time Barber, Mackey, and Starr collected stories from the original decoy makers and their friends, many of whom were bay men or boat builders, who described a life spent on the water that has long since passed into memory. Mackey summarized his collecting experiences in an influential book, American Bird Decoys. Likewise, George Starr wrote a colorful and beautifully illustrated book, Decoys of the Atlantic Flyway. All three of these books remain available today through on-line booksellers such as Amazon.com. After Joel Barber’s death in 1948, his collection was acquired by the Shelburne Museum. Today these carvings form the core of the Shelburne Museum’s magnificent decoy collection, which resides in the Dorset House. In contrast, the Mackey and Starr collections were sold at auction by the Richard A. Bourne Co. of Hyannis, MA. in 1970-1971 and 1986 respectively These public auctions set a new standard for decoy prices and provided a robust market for buying and selling these works of folk art. 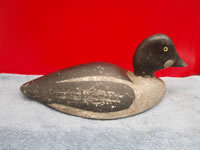 Even today decoy auctions continue to be an important source for acquiring and learning about these artifacts (for example, see the Guyette and Schmidt Auction Company website at http://www.guyetteandschmidt.com). Closer to home, how can the indoor birder indulge his or her hobby when the weather precludes birding outdoors? In season, visiting the Shelburne Museum’s Dorset House is one possibility, of course. The museum owns arguably the finest collection of antique decoys on public display on the planet. Though they are not antique decoys, the Birds of Vermont Museum in Huntington boasts a fine collection of wooden birds hand-carved by the irrepressible Bob Spear. As an additional benefit, the BOVM includes a large picture window looking out on feeders that attract many local birds and other wild life. The BOVM website can be accessed at http://www.birdsofvermont.org. Farther afield, if you happen to be traveling on the Eastern Shore of Maryland, there is an outstanding collection of carved birds at the Ward Museum in Salisbury, Maryland (http://www.wardmuseum.org). Lem and Steve Ward were brothers from Crisfield, Maryland who became carvers in the 1920’s and whose working and decorative decoys command premier prices in today’s market. Every year the Ward Museum sponsors a bird carving competition dedicated to the memory of Lem and Steve that attracts the world’s finest bird sculptors. If you visit the museum you may want to bring a field guide along. A huge variety of antique and decorative bird carvings are on display in a bucolic setting. Waterfowl decoys occupy a unique chapter in American folk art history coincident with the country's emerging interest in conservation. Visit a few of the websites identified in this article to stoke your interest, then visit one or more of the museums in your pursuit of the sport of indoor birding. Photo by Pam MacPherson of a Steven's "humpback style" Goldeneye c.1890. The National Audubon Society will reopen its legendary Hog Island for four adult ornithology sessions and one teen bird studies session during the summer of 2010. Dr. Steve Kress, Audubon’s VP for Bird Conservation will direct the sessions. He will be joined by some of the country’s top ornithologists who will serve as instructors, including - Kenn Kaufman, Pete Dunne, and Scott Weidensaul. Additionally, said Dr. Kress, there will be two totally new sessions offered in association with Elder Hostel (now Exploritas) where participants will assist Project Puffin biologists to census gulls, eiders and cormorants at several nearby seabird nesting islands. Participants in the September session will learn about land and seabirds through bird banding and presentations and assist with a habitat management project for endangered terns and storm-petrels at Eastern Egg Rock. Known to thousands as the Audubon Camp in Maine, Hog Island was closed during the summer of 2009 to permit planning for the future. This process led to Project Puffin bringing back the popular ornithology programs for adults and teens. The adult programs are for both beginning and avid birders who would like to learn more about Maine birdlife and the biology of birds. The teen session is for 14-17 year olds with a keen interest in birds. This session is co-sponsored by the American Birding Association. Due to its varied habitats, Hog Island and vicinity are an ideal setting for the program, as more than 100 species frequent the area. Participants live in authentic, turn of the century housing on the 330 acre spruce-covered island. Here, they will enjoy three home-cooked meals a day in an historic island farmhouse that overlooks Muscongus Bay. During the five-day sessions, small field groups will go on a variety of trips and boat cruises, and attend workshops and presentations on topics ranging from migration and the identification of warblers to the restoration of Atlantic Puffins and terns on nearby Eastern Egg Rock. The Hog Island camp first opened in 1936, with Roger Tory Peterson as its first bird instructor. It is well known in America’s environmental community as a distinguished and beautiful place of learning and enjoyment. For more information on dates, sessions, costs, instructors, etc. visit www.projectpuffin.org To read testimonials and see photos from previous Hog Island programs, visit www.naturecompass.org/fohi. The Catamount Outdoor Family Center is a 500 acre preserve on Governor Chittenden Road in Williston owned by Jim and Lucy McCullough. It is a recreational facility offering mountain biking, running and hiking in the summer and fall, and cross-country skiing and snowshoeing in the winter. It is operated as not for profit organization with a master Plan for future development and use. This property is rich in bird life. It consists of a number of diverse habitats including northern hardwood, white pine-hardwood, and hemlock forests, early successional forest, marshes, ponds, and open fields and grasslands. Between 1996 and 2008 we identified 94 species at Catamount and confirmed breeding status on 24 during the Vermont Breeding Bird Atlas years, 2003-2007. The GMAS has held several field trips at Catamount all of which have been very productive and enjoyable. This prompted us to think that Catamount would be a great addition to Vermont areas designated by Audubon Vermont as IBAs (Important Bird Areas). To this end, we at the GMAS, with the assistance and enthusiastic cooperation of the McCulloughs, submitted an application for IBA status to Audubon Vermont in September 2008. Our arguments were as follows: Catamount includes several healthy habitats producing a wide diversity of bird species, both migratory and breeding; Catamount has several areas of grasslands with well established breeding populations of Bobolinks and Savannah Sparrows; finally, management practices at Catamount optimize breeding success. A major focus of the owner’s not for profit organization is to increase educational opportunities for nature and conservation. We envision Catamount becoming a major nature education center in Chittenden County. In support of our application to AV, since April, 2009, we have been monitoring birds on the Catamount property each week. Every Thursday morning we survey one of the four quadrants at Catamount. Thus, we cover the whole area every four weeks. We do cumulative counts, taking care not to double count birds on the return route. Each count takes two to three hours. Regular participants in the monitoring walks so far are Ali Wagner, Bill Mercia, Bruce MacPherson, Larry Haugh, Louanne Nielsen, Bill and Mae Mayville, and myself. On our thirteen outings this spring and summer, we recorded 79 species, including eight that are new for the area. We confirmed breeding in 17 species, seven new for the area. Notable new species include Winter Wren, Osprey, and Blue-winged Warbler. New breeding confirmations include Wood Duck, Mallard, American Kestrel, Eastern Phoebe, Yellow-bellied Sapsucker, Rose-breasted Grosbeak, and Baltimore Oriole. Thus, to date we have identified a total of 102 species, including 31 confirmed breeders. All of our data from 2009 have been entered into the VT eBird database. Audubon Vermont has yet to make a decision on our application for IBA status. On July 20, Bruce MacPherson, Lucy, Jim and I met with Jim Shallow of AV to discuss the progress of our application. Jim indicated that the IBA concept and process is in flux and is probably moving in the direction of larger tracts of land for inclusion as an IBA. Nevertheless, the IBA application remains active, and we agreed upon a common goal for Catamount: that all parties will work together toward conservation, stewardship, and education at Catamount, particularly with regards to birds and bird habitat. Several steps were articulated and assigned which we hope will achieve this goal. In the meantime, we will continue our monitoring efforts. So if you would like to enjoy excellent birding on Thursday mornings, come over to the Catamount Family Center and join us. The more eyes and ears we have helping out, the more complete our counts will be. The photograph of a male Scarlet Tanager is courtesy of Roy Pilcher. After many years of service to the Green Mountain Audubon Society, Caryn Gronvold has retired from the Board of Directors. Since 1977, Caryn has been a member of the Board for all except 5 years. She served for four years as the President of the Board in the past and has just completed a two year term as our Treasurer. In between, Caryn has served the Green Mountain Audubon Society in many capacities. Back in the days when volunteers were the “staff” of the Green Mountain Audubon Center, Caryn was an ecology field trip guide. For two years, she chaired the auction to raise funds to support the Audubon Center, an undertaking which required an enormous commitment of time and energy. For many years, Caryn co-chaired the committee which organized and ran the Sugar on Snow parties at the Audubon Center and she continues to volunteer to help staff that event. Caryn is one of the few people who can be called upon to cook syrup up to the proper temperature so it will “wax” properly when drizzled upon the snow! For many years, Caryn was the chairperson of the Program Committee for the Green Mountain Audubon Society and she will continue to be a committee member after leaving the Board. Currently, Caryn is a team leader in employee and labor relations for Human Resource Services at UVM. We look forward to seeing her at many GMAS events in the future and wish her the best of luck in her retirement from the board. She leaves the Board with our heartfelt thanks for a job well done. Tucked away near the eastern border of Hinesburg is an 840 acre tract of public land known as the Hinesburg Town Forest. In July, 2008, Aaron Worthley evaluated this property on behalf of Audubon Vermont and wrote a report entitled “Forest Bird Habitat Assessment and Management Recommendations”. This report represents an excellent example of Audubon Vermont’s major conservation effort known as the Forest Bird Initiative. Working with private landowners and conservation committees in Vermont’s towns, wildlife biologists from Audubon Vermont assess the suitability of the available habitat to support birds and other wildlife, especially so-called responsibility birds, and offer management recommendations for improving or sustaining this habitat for birds. An important aspect of this evaluation is to confirm that the birds predicted to occupy the property are actually present. That’s where GMAS volunteers come in. At the request of Steve Hagenbuch from Audubon Vermont, Bill Mercia organized a group of volunteers who visited the Hinesburg Town Forest on two occasions during the breeding season in June, performing area counts of the birds that were seen and heard at four selected points in the forest. This is an account of one of those monitoring walks. We meet in the parking area near Hayden Hill Road West and walk to the first of the two points that Steve has selected for us. The weather is mild, 61 degrees, and cloudy with a threat of rain. Good weather for birding. This parcel of land consists mainly of Northern Hardwood Forest, especially sugar maple, white ash and beech trees. However, a patch of this forest has been recently harvested. We will evaluate points in both the disturbed and the undisturbed areas. Naturally, we will identify all of the birds that we hear or see, although the focus is on responsibility birds. At point 1, the harvested area, Ali Wagner hears and identifies the first bird as usual, an Ovenbird. In quick succession Bill Mercia and Mae Mayville identify a Black-throated Blue Warbler, a Blue-headed Vireo, and a Black-throated Green Warbler-all responsibility birds. We are off to a good start. Bill Mayville spots another Ovenbird flitting around in the brush. Possibly there is a nesting pair. Bill Mercia picks out the song of a Mourning Warbler, an excellent discovery. I identify a Blue Jay. After 30 minutes of watching and listening we move on to point 2 a few hundred yards down the trail. This area is undisturbed forest. Still we hear birds. First we hear a Yellow-bellied Sapsucker’s beat, trailing, off at the end. Then another Blue Jay jeering at us. Next we hear the flutey song of a Wood Thrush in the distance. Cool. Shirley Johnson finds a Black-and-White Warbler inching out on a branch above us. Shirley always finds Black-and-white Warblers when I can’t. Chip Wright points out a Downy Woodpecker that is tapping on a dead snag nearby. Nice. Ovenbirds seem to be everywhere. And both Red-eyed and Blue-headed Vireos call from above. Without acute hearing these birds probably would have been missed. After 30 minutes we have heard and seen enough. It is time to move on to points 3 and 4. But wait. A Broad-winged Hawk is circling overhead. Not a responsibility bird, but a welcome sighting nonetheless. No wonder the woods became so noisy when we walked out. Steve’s monitoring protocol states that we only need to spend 6 minutes at each point to count the birds adequately, but we enjoy spending time in the forest and allow ourselves to dally. The next points are located on the opposite side of the Hinesburg Town Forest near the entrance at Economou Road. Here the habitat changes again. Point 3 is a softwood plantation composed of white pine, red pine, and Norway spruce. Here we expect to find Pine Warbler, Blackburnian Warbler, and Dark-eyed Juncos and we do! In fact, juncos are chattering everywhere. We hear, an Eastern Wood-Pewee in the distance as well as more vireos. Alison hears a Yellow-rumped Warbler, but I’m not sure. She’s probably right. Carl Runge spots still another Ovenbird as well as a White-breasted Nuthatch. Enough. We move on to point 4. Point 4 consists of a stand of young Northern Hardwoods. Immediately, we hear the songs of Black-throated Green and Black-throated Blue Warblers. At the very top of a tall sugar maple Bill Mercia identifies a handsome male Baltimore Oriole. Otherwise, the woods are getting quieter as the morning progresses. A Veery, a Wood Thrush, and a few vireos fill out the list. We are done for today. But we will return here in two weeks to repeat this walk. We are coming to the end of the breeding season, so we expect that the woods will be quieter the next time that we do our point counts. In the meantime the data will be entered into the Vermont eBird database and sent to Steve. He will compare our observations with his predictions and will follow the results that we obtain in the managed areas as the early successional forest matures. We look forward to participating in the Forest Bird Initiative next year and for many years to come. The aerial map of the Hinesburg Town Forest showing habitat sections and count points is provided courtesy of Steve Hagenbuch. Even if you haven’t spent much time in the kitchen, it is likely you have come across the term "a baker’s dozen" and would know roughly where to look for one of the "dozen". However, would you know where to look for one of the "birder’s dozen" or even what this term refers to? Recently, Audubon Vermont published a list called The Birder’s Dozen, twelve common breeding birds in Vermont that Audubon is working hard to protect. These are birds, sometimes referred to as “responsibility birds”, which have “…a high proportion of its global population breeding in the region”, implying that conservation efforts should focus on preserving habitat where these birds have been observed. The twelve responsibility birds that make up the "Birder's Dozen" include American Woodcock, Yellow-bellied Sapsucker, Eastern Wood-Pewee, Blue-headed Vireo, Veery, Wood Thrush, Chestnut-sided Warbler, Black-throated Blue Warbler, Black-throated Green Warbler, Canada Warbler, White-throated Sparrow, and Scarlet Tanager. In June, 2008, I worked with the The Nature Conservancy to study which bird species occurred in forests bordering the Little Chazy River in northeastern New York. Such forests are known as riparian zones or buffer strips and they tend to host a greater diversity of plants and animals than the surrounding landscape. The landscape within the Little Chazy watershed is a mixed-use habitat, typical of the Lake Champlain valley. As one drives through this basin, agricultural fields, small villages, and rivers descending from the nearby Adirondack Mountains are a few of the common sights. The riparian condition of this habitat such as many trees or no trees, the proximity of agriculture to the river, and whether the forest strip along the river is continuous or highly fragmented, is significant for many reasons, including water quality and bird activity. Traveling downstream from the headwaters of the Little Chazy River, the width of the riparian zone varies from 100+feet to just several feet. Overall, the buffer zone is considerably less in the lower reaches of the river. Thus, I speculated that the species richness, that is the number of different kinds of forest dwelling birds, would decrease significantly as one moved downstream. Interestingly enough, my data did not support this hypothesis. Each site had a species richness ranging from 6 to 22 per site and there was no evidence for a linear, decreasing trend from upstream to downstream. What was significant was that the number of species observed at sites that were moderately disturbed was greater than the numbers of species observed at either minimally or heavily disturbed sites. At these sites along the river I observed examples of all of the "Birder's Dozen" except American Woodcock and Canada Warbler. My results agree with the findings of a classic 1978 study by Joseph Connell that described the “intermediate disturbance hypothesis”. Essentially, his idea was that moderately disturbed landscapes have greater species diversity than minimally or heavily disturbed landscapes. Why should this be true? Think about an intact forest with no gaps, clearings, standing dead trees or coarse woody debris on the ground and no difference in the height of the canopy. This is an example of minimally disturbed habitat and species diversity typically is low. Compare this to a forest that has just gone through a large windstorm. Some trees have been knocked down, providing gaps and space for sun-dependent herbs and saplings to sprout. There may be standing dead trees or dead trees on the ground (i.e. coarse woody debris). This moderately disturbed forest provides greater diversity of habitat than is true in minimally disturbed forests and therefore provides habitat for a greater variety of species. The management implications of my observations are that perhaps in some areas of urban development, there may be benefit to maintaining moderate levels of disturbance. Maintaining open spaces around houses, selective harvesting of trees to diversify the canopy structure and provide gaps, allowing standing dead trees and coarse woody debris to stay on the ground for brush nesting birds and other animals are examples of management practices that might promote species diversity. Even creating a small buffer strip along a river can improve water quality tremendously whereas leaving no buffer strip at all provides habitat for few, if any, birds. One of the first steps in any land management plan is to recognize what is present compared to what is desired. Becoming familiar with the Birder’s Dozen then finding these birds in the public land in your community is one step toward becoming a proactive land manager supporting community-based efforts that maintain water quality and increase local biodiversity. David Jaffe is a graduate student in the Field Naturalist program at the University of Vermont. He will receive his M.S. degree in May, 2009. Thanks to Jim Shallow from Audubon Vermont for providing the photograph of the Black-throated Blue Warbler family. Driving on the Bolton Notch Road in April is hazardous at best. Peregrine FalconIt's mud season, you know. Still, Shirley Johnson seems to be in control of the vehicle and besides, I'm not looking. Finally, we reach the spot we've been searching for. Chip Wright and Larry Haugh are there already. And a few minutes later Margaret Fowle drives up. We are gathered at the foot of one of the many cliffs visible from the Bolton Notch Road. But this one is special. It has been the site of a Peregrine Falcon nest for the past several years. We are here to receive training from Margaret for the Peregrine Falcon Monitoring Project, the follow up to the Peregrine Falcon Recovery Program that concluded a few years ago. Peregrine Falcons are amazing birds. They can dive through the air at a speed of more than 200 miles per hour to catch their prey. But not too many years ago the Peregrine Falcon population was decimated by the pesticide DDT. Peregrine Falcons are perched at the top of the food chain. As a result, when DDT seeped into the food chain, it accumulated in the flesh of the falcons. The result was a marked decrease in egg production. DDT caused the eggs to be thin-shelled, fragile, and often non-viable. As time went on the population of Peregrine Falcons dropped precipitously as older birds died and were not replaced by fledged chicks. In fact, the eastern population was entirely eradicated. In the west, fewer than 400 nesting pairs of falcons remained, roughly 10% of the number found in better times. Enter the U.S. government. In the 1972 the agricultural use of DDT was banned and Peregrine Falcons were placed on the Endangered Species list. In the late 1970's the Peregrine Falcon Recovery Program was begun. Over the next 20 years the Peregrine Falcon population increased dramatically. Currently, there are over 1600 nesting pairs in North America, far exceeding the program's goal of 631 nesting pairs. A few years ago Peregrine Falcons were delisted, but until 2015, there will be a continuing need to monitor the falcon population to be sure that this increase is sustained. That's where we come in. Margaret tells us that last year there were 38 Peregrine Falcon nesting spots in Vermont. This is one of them. I stare at the face of the cliff. The cliff stares back. I see nothing. Suddenly, Margaret says, "I saw a feather move." Huh! "Up there. To the right of the bush at 1 o'clock, halfway up the cliff." I look through her scope. Sure enough I see the tail of a bird moving up and down. A falcon? Yes! A majestic male falcon flies into view and lands on a snag 25 yards from the nest site. A few minutes later he flies to the nest site. The female immediately flies off. This is what passes for courtship behavior among falcons. For the next few hours we watch the pair fly back and forth putting on a nice aerial show. Margaret patiently educates us on falcon lore, the recovery project, and our role in the monitoring program. We watch and listen. By 1:30 P.M. it's over. One of the birds has left the site and the other is hidden in a cranny. Peregrine Falcons spend a lot of time conserving energy, Margaret assures us. No matter. We have learned what we need to know. The next week, and for several weeks thereafter through June and early July we visit Snake Mountain to monitor the falcon’s nest there. Snake Mountain has been a reliable nesting site for falcons since at least 2001. Eric Lazarus, Bill Mercia, and Andrew Webbe lead the charge. The cliff face is visible from the parking lot, but Eric discovers a better spot closer to the mountain. During the season we see the falcons and watch their behavior, but, alas-no nest and no chicks. Finally, we conclude that their nesting attempt has failed. Why? Weather? Poor site selection? Predation? Human disturbance? Who knows. Hopefully, the falcons will be back at Snake Mountain next year and will achieve reproductive success. Hopefully, we will be back there, too, to wait and watch the falcon’s nest. Photograph of a Female Peregrine Falcon at Fairlee by Steve Faccio. April 29, 2008. Bristol Pond. 6:45 P.M. 42 degrees F. Overcast. No wind. A single Sandhill Crane just flew into the marsh south of the boat access parking lot. Those are my field notes from that April evening. But Sandhill Cranes in Vermont? You bet! For the past 3-4 years Sandhill Cranes have been sighted regularly in Vermont and in 2007 a pair of Sandhill Cranes successfully fledged a single chick. This information was dutifully recorded in the most recent Vermont Bird Breeding Atlas Survey. This year this pair of cranes returned to Vermont and produced two “colts”, as young cranes are called. Here is some background information about one of Vermont’s newest resident bird species. All told there are 15 species of cranes worldwide, but only two species of cranes inhabit North America-Whooping Cranes, which are endangered, and Sandhill Cranes, which are thriving. In fact, there are over 600,000 Sandhill Cranes in North America. The breeding range of Sandhill Cranes extends from Siberia, through Alaska and western Canada to the Pacific Northwest and the northern Midwestern states. Vermont is at the far eastern edge of the Sandhill Crane’s range, but, who knows? Perhaps their range is expanding as their population grows. The winter range of Sandhill Cranes includes south Texas, south-central New Mexico, Arizona, and northern Mexico. Cranes also gather in staging areas during their Spring and Fall migration. More on this later. Cranes are ancient birds. In fact, a 10 million year old crane fossil was excavated from the tar pits found at the Ashfall Fossil beds in Nebraska and a Sandhill Crane fossil identical in every detail to modern Sandhill Cranes was carbon-dated at 2,000,000 years old. Apparently, Sandhill Cranes can adapt successfully to a changing environment. Five Sandhill Crane subspecies have been described in the ornithological literature, two of which are migratory and three of which are not. Migratory Sandhill Cranes include the Greater and Lesser subspecies. Some authorities also include an intermediate-sized subspecies on this list-the Canadian subspecies. However, where cranes mingle on their wintering grounds, these intermediate-sized birds overlap at both ends of the growth spectrum with Greater and Lesser Sandhll Cranes and cannot be reliably distinguished from them by either morphological criteria or DNA analysis. The non-migratory subspecies are found in Cuba, Florida, and Mississippi. The Sandhill Crane population in Florida appears to be stable, but both the Mississippi and Cuban subspecies are endangered. Sandhill Cranes are majestic birds, somewhat resembling herons and egrets. Herons, egrets, and cranes are not closely related, though. Great Blue Herons and Great Egrets are assigned to the family Ardeidae, whereas cranes occupy the family Gruidae. The scientific name for Sandhill Cranes is Grus canadensis. Sandhill Cranes are 3-4 feet in length with a wing span approaching six feet. They have three long toes on their feet attached to long, featherless legs. Cranes also have a vestigial posterior toe. However, unlike herons and egrets, cranes are unable to grasp branches. Accordingly, cranes roost on the ground, rather than in trees or perches like herons and egrets. Also, cranes fly with their neck extended in contrast to herons and egrets which fly with their neck coiled. Sandhill Crane plumage is gray overall, but often their feathers take on a rust color due to “painting” with iron-rich soil during preening. In addition to their long, dagger-shaped bill, adult Sandhill Cranes have a distinctive red crown, which becomes more prominent when they are excited, and a white face patch. In general, Sandhill Cranes are so distinctive that differentiating them from herons and egrets is not difficult. And Sandhill Cranes dance! With enthusiasm! Why cranes dance is not fully understood, but this behavior probably serves as a courtship ritual during breeding season and a means of communication between cranes otherwise. Body posturing generally is a feature of crane behavior which may signify a warning to other cranes in the area that are vying for territory, a predator alert , or simply a sign from a leader saying “Let’s go.” Similarly, Sandhill Cranes utter a vast number of vocalizations to each other, including distinct contact, flight intention, location, and alarm calls. Sandhill Cranes are omnivores, their diet consisting of grains, mice, snakes, frogs, eggs, and insects. However, on their staging grounds 80% of their diet consists of waste grain, especially corn. Managing the crane population on their wintering grounds and staging areas, where thousands of Sandhill Cranes gather, represents a formidable challenge, since a single Sandhill Crane consumes up to a half pound of grain per day. At the Rowe Audubon Sanctuary in Gibbon, Nebraska, where 500,000 Sandhill Cranes congregate for a month in March and April before leaving for their breeding grounds, cranes eat about 1600 tons of waste corn during their stay. Sandhill Cranes become sexually mature at 2-6 years of age and typically hatch 1-2 eggs in breeding season. Nests typically are constructed in a marsh surrounded by water where cranes roost at night. This habitat provides protection from nosy (and noisy) predators, who might attack the nest. Since on average Sandhill Cranes live about 25 years, they may produce a large number of offspring during their lifespan. Cranes are monogamous more or less and the family unit stays together during migration. Accordingly, scanning large flocks of Sandhill Cranes when they are on their wintering grounds reveals small clusters of cranes mingling and flying together. These birds represent family units. In November, 2007, my wife Pam and I attended the 20th annual “Festival of the Cranes” at Bosque del Apache NWR in San Antonio, New Mexico. This festival celebrates the return of over 5000 Sandhill Cranes to their wintering grounds. We attended a variety of workshops and field trips, many devoted to Sandhill Cranes as well as the large variety of waterfowl and raptors that inhabit the refuge. One of our instructors was Keanna Leonard, the education coordinator at Rowe Audubon Sanctuary in Nebraska, the staging area for over 500,000 Sandhill Cranes in March-April. Keanna graciously agreed to answer a few questions about Sandhill Cranes for this article. Thanks to Bill and Mae Mayville who generously provided photographs of the Bristol Pond Cranes. 1. Keanna, during March and April, the Rowe Audubon Sanctuary, where you work, probably hosts more Sandhill Cranes than any other place in the world. What makes Rowe so special? How was your season last year? species of cranes in the world. From around Valentine’s Day to Tax Day (April 15th) we see over 500,000 cranes. Rowe Sanctuary is located just yards from the some the most pristine river habit that cranes use for roosting. We had around 12,000 visitors from all 50 states and 44 countries last year to witness what has been dubbed one of the top ten wildlife spectacles in the world. 2. The Sandhill Crane population seems to be thriving. Have Sandhill Cranes always been numerous or is this a recent phenomenon? Do you perceive any major threats to the population down the road? In the 70’s it was reported that there were around 300,000 sandhill cranes. Over the past 30 years the population has grown to over a half million. The staging area along the Platte River is considered the critical point in the central migration route. Cranes stay in the area for approximately three weeks eating enough food to add around 20% to their body weight. The extra weight allows them to finish their migration north in good condition and ready to begin the nesting season. For those cranes who are looking for a mate, the Platte River is also considered the night club of love. The major threat is the loss of habitat. The river is diverted, dammed, supplies water for residential, industrial, agriculture, and recreational use. What is left over is for wildlife. The river is also threatened with invasive species such as phragmites, purple loosestrife and now salt cedar. We work with many other conservation organizations negotiating water usage and keeping the river channels clear and usable for the cranes and other animals that prefer wide, open, sandy channels – such as whooping cranes, piping plovers and least terns. 3. As you know, Sandhill Cranes are beginning to appear in the Northeast, including Vermont. Is there good evidence that Sandhill Cranes are expanding their range? We have heard that cranes are moving into new and previously abandoned territories. That is good to hear! 4. The Sandhill Crane population is currently large and stable, whereas Whooping Cranes are endangered with less than 500 individuals alive in the United States. How do you account for the striking difference in the success of these two related birds? Actually in this flyway we had over 250 whoopers migrate north this spring! With the introduced eastern population there are now around 400 whooping cranes. To put it simply, many have surmised that whooping cranes are just pickier when it comes to both habitat and food than Sandhill Cranes. 5. Where can birders go to find out more about Sandhill Cranes? Do you have a favorite book or reference? I recommend that anyone who would like to read more about Sandhill Cranes find these two books: On Ancient Wings by Michael Forsberg and Crane Music by Dr. Paul Johnsgard. Good websites include the International Crane Foundation (www.savingcranes.org), Platte River Whooping Crane Maintenance Trust (www.whoopingcrane.org) and of course our website at www.rowesanctuary.org. Don’t forget to check out the Crane Cam that runs live throughout March and April. A great DVD is Crane Song by the NET Foundation for Television. 6. If Vermonters would like to plan a trip to the Rowe Audubon Sanctuary in Nebraska to see the Sandhill Cranes, what is the best time of year to visit? Do you conduct an organized program of lectures and field trips during the crane season? The best time to see Sandhill Cranes is the first of March through the first week of April. We conduct field trips to our viewing blinds twice a day – 6:30 A.M. and P.M. - to watch cranes leave or come back to the river. During the day throughout the season we offer public educational programs. If people would like to get more involved, we also conduct one of the oldest wildlife conferences in the United States, the Rivers and Wildlife Celebration. We also offer families the chance to learn about cranes together at our Family Crane Carnival. If you are not able to come to Rowe, do check out the Crane Cam on our website. To make reservations or to learn more about next year’s events, just give us a call at 308-468-5282. 7. I am confused about the subspecies of Sandhill Cranes. What is the basis for splitting out the Canadian subspecies from the lessers and greaters? Or is this separation not warranted? Most biologists have dropped the Canadian subspecies. In the field it can be difficult to distinguish lessers from greaters, but basically the lesser sandhills are 20% smaller. Through this flyway we have the majority of the lesser Sandhill Cranes in the world, but we also see greaters. 8. I was surprised to discover that hunting Sandhill Cranes is permitted, although cranes are covered under the Migratory Bird Treaty. What is the impact of hunting on the Sandhill Crane population? Most of the states in the western part of the United States do hunt Sandhill Cranes. Nebraska is the only state in the central migratory route that does not hunt them, in fact. Right now we are seeing no obvious impact of hunting on the growth of the crane population, though.